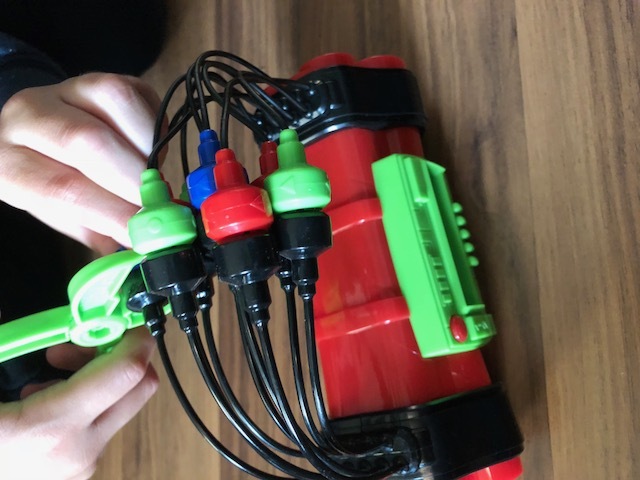 Looking for the ultimate hands on, interactive game fun for this holiday season? Look no further than these three exciting games that will shock, blast and test your mind and creativity. Family game night is one of the most important nights of the week for our family. We are so busy with work, school and soccer, that these hours are important for us to unwind and reconnect over food and games (can life get any better?). We all know that the game makes the night, you need to find a game that will interest everyone (in our family that means two adults, a teenager and a child) and that is fast paced and exciting – no easy feat right? 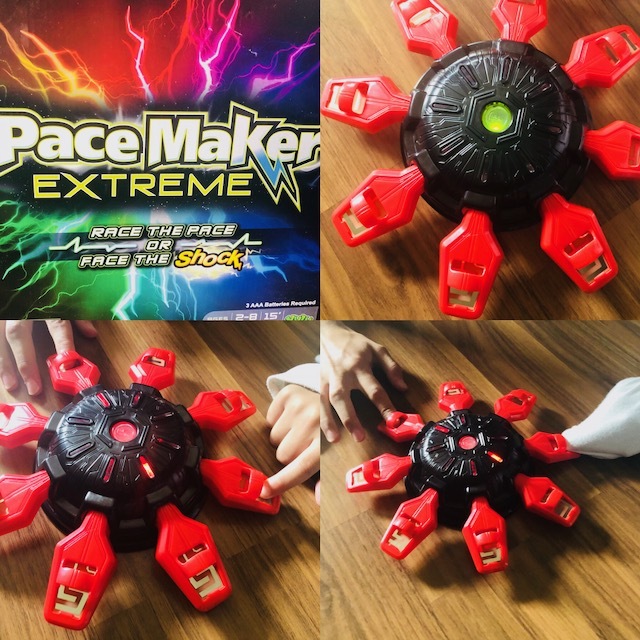 Pacemaker Extreme is a fast paced game for all ages. All players are forced to pay attention and think quick otherwise you risk facing a shock! You can play with a minimum of two people and up to eight. Each players places a finger on one of the red pieces (shown above) after setting the game mode. Players take turn following the pace of the game by pushing down on the red piece either once to continue in the same pattern or twice to reverse the order. If you are too slow, press out-of-order or don’t pay attention – you will face a shock (very minor buzz on your finger but it gave me a surprise the first time as I wasn’t expecting it). Our youngest tried to get around the shock part by covering his finger with his shirt – didn’t work! Looking for fun that tests your guessing ability under pressure? Cut the Wire is the game for you and your family! This game actually became one of our favourite out of these three games and out of all of our other games we have at home. 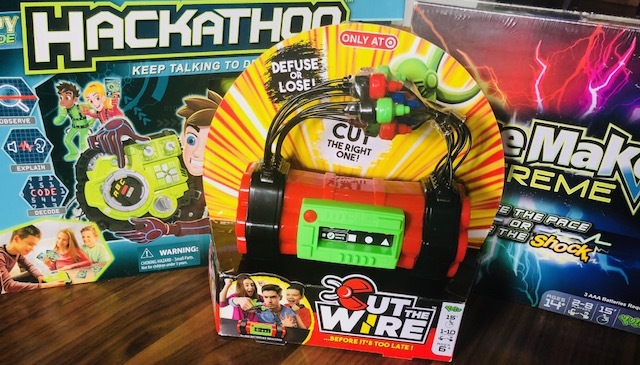 Cut the Wire is a game of luck as you work towards defusing the bomb. 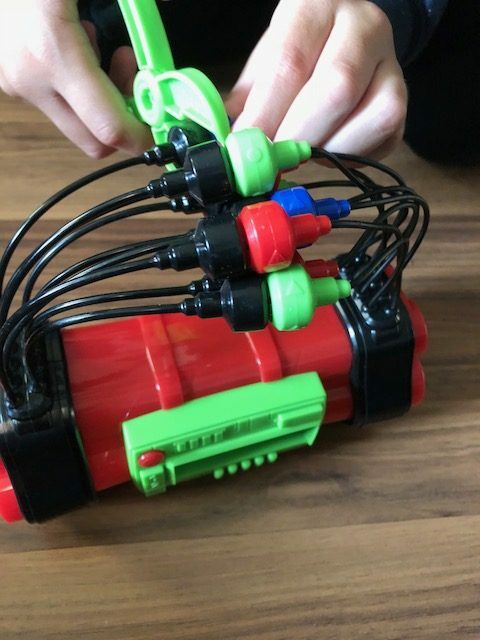 You need to accomplish this by cutting each wire to find the special wire that turns the bomb off without setting the whole thing off. 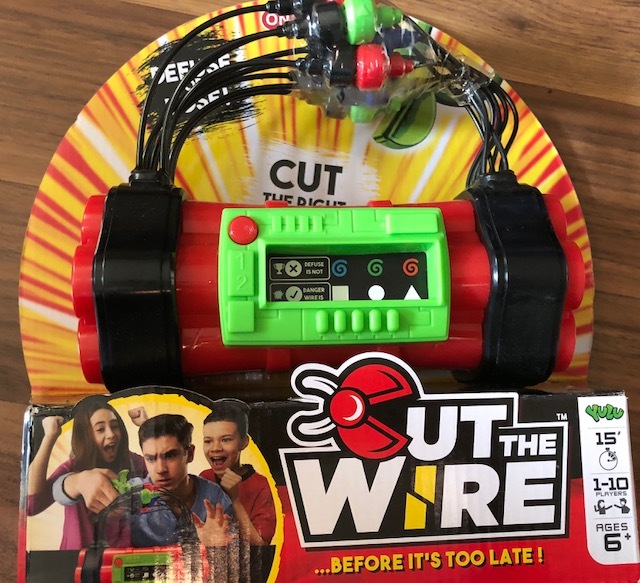 We loved how it lit up if you accidentally cut the wrong wire and the special noise it made when you cut the wire that defused it (that was such an awesome feeling because you knew right then that you were the champion). 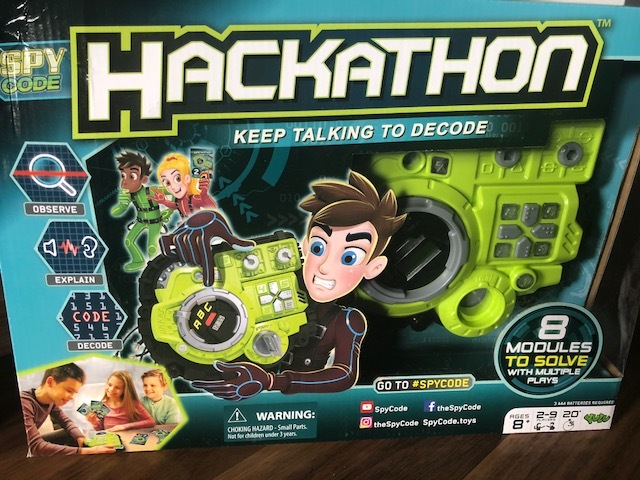 Hackathon is one of the latest games in the Spy Code group of games from YULU. In this game your identity has been stolen by a group of villains and has been saved inside a super advanced console. You are in possession of the console and your Spy Code squad has instructions to hack and retrieve the secret information. However, only one person can see and work on the console at a time. You can only hear each other. You are forced to work together with lots of talking in order to decode the console in a set amount of time (two thumbs up for lots of communication). We loved the pressure, feeling like a spy (who doesn’t love this feeling) and loved that you have to work together to solve the secret information. All three games will make for a perfect gift for the holidays or even just before the holiday season starts so that you can spend some downtime with the kids during the busyness of the season. What do you look for in a family game? Make sure you follow YULU on Twitter and Facebook to keep up to date with all the latest games and more. Disclosure: I received the above mentioned games in order to facilitate this review. All opinions expressed are my own.